So it’s Sunday evening, I’m sitting in the stands at my first hockey game (which also happens to a hockey game in which Date #7 is playing) and I have officially run out of snacks. As such, I decide to make an effort to talk to the woman in the Cubs t-shirt seated to my right. She and I represent 66% of the total attendees scattered throughout the stands, after all. “Which one is yours?” she asks. “The one in the middle,” I reply. She looks at me like I’m a bit crazy, which I probably am, but finally smiles and nods in understanding when I mention the magic words: Match.com. At this point, I turn my focus back to the game. To be honest, I really need to use the restroom but I’m afraid that Date #7 will do something exciting the moment I get up so I wait, and wait, and wait and finally sprint down the steps after he makes a fabulous… shot? Score? Goal? I have no idea. At any rate, it was cool. And I didn’t miss it. In the end, “the white team” loses but the woman in the Cubs t-shirt assures me that this is only their second loss all year. I check my makeup and head down towards the locker rooms to wait for Date #7 but after twiddling my thumbs for ten minutes, I start to feel rather stupid. His teammates don’t even bother to glance in my direction as they emerge, one by one, and suddenly my Victoria’s Secret get up seems a bit over the top. Oh well. We still have one more day together. PS: Have you voted today? 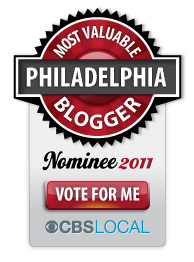 I’ve been nominated for “Philadelphia’s Most Valuable Blogger” and I need your help! You can vote for me everyday, once a day until September 9th (no login or registration nonsense required) so please click on “VOTE FOR ME” to cast your vote. THANKS! I voted and I do not live in your country! I voted! Loved that you were at a hockey game. My brother just wrapped up his season and it sounds like the same kind of setting my sister and I were in when we went. His “girlfriend” came to watch that night as well. I’m going to go start from Pittsburgh Part 1 because I’m majorly behind. Not sure what benifit the team were going to get from the underware, well unless it was all part of some elaborate victory dance you had planned.